Starbucks and Caribou Coffee are the best places in town to stop for some caffeine. 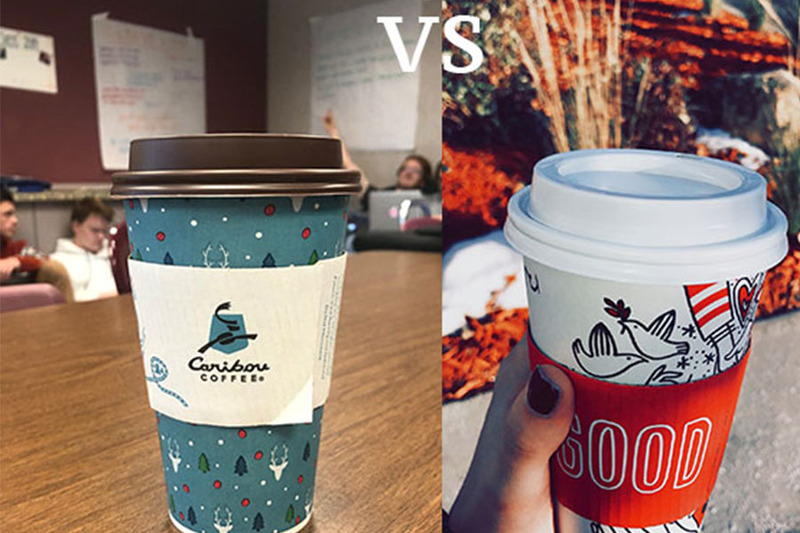 There has always been a big debate on which coffee place is better, Starbucks or Caribou Coffee. Every student is guilty of stopping to get some coffee at either Starbucks or Caribou Coffee before school on a Wednesday morning or before a sporting event. To some SHS students, drinking coffee is an essential part of their morning and helps them get through the long school day. Many students spend time at local coffee shops afterschool doing their homework. Starbucks and Caribou Coffee are prime hang out spots for Sartell students. Caribou Coffee has many different brews you can buy when you stop in to get your morning coffee. After trying both Starbucks and Caribou Coffee, I decided that Starbucks is the coffee place for me. In my opinion, the atmosphere and coffee at Starbucks are better than Caribou Coffee. Both coffee shops have yummy drinks, but Starbucks has many specialty drinks that are sure to satisfy your every need. Sure, Caribou Coffee has tasty smoothies and frappuccinos, but Starbucks has refreshers and delicious teas for those of us with a sweet tooth. Starbucks also has scrumptious treats like cake pops and rice crispy bars where Caribou Coffee has more breakfast sandwiches. Both coffee shops are great places to stop for a quick coffee break, but Starbucks’ coffee and service definitely tops that of Caribou Coffee. Knowing that I preferred Starbucks over Caribou Coffee made me wonder what other students at SHS favor. 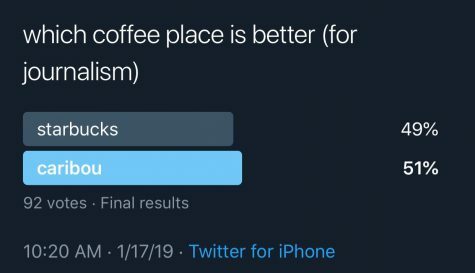 I put out a twitter poll asking which coffee place people prefer. I let the poll run for 24 hours and gave the options of Starbucks or Caribou. When I looked at the final numbers, the results were astonishing. 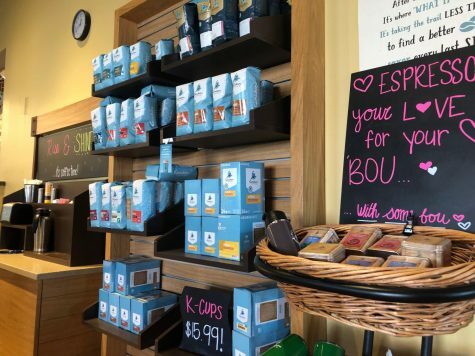 Caribou Coffee beat Starbucks 51% to 49%. The poll showed that students like Caribou and Starbucks about the same amount. Some students said it depends on the location and cost. What's your Starbucks cup preference? I like the green, it's good try new things. Forget red or green— nothing will ever beat the original! Just get me my coffee. These are the final results of the Starbucks vs Caribou debate according to the students of Sartell. After reviewing the results of my poll, I decided to investigate further by asking some SHS students in person. Senior Kendra Bokelman responded promptly with Starbucks. 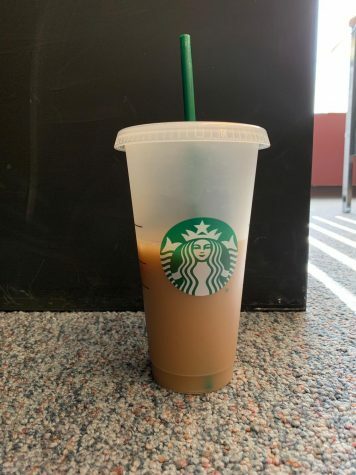 She said, “I just like the way Starbucks coffee tastes more than Caribou Coffee.” She continued to say, “The only downfall is that Starbucks is farther away and can cost more money.” Though many people prefer Starbucks over Caribou Coffee there are some exceptions. These simple Starbucks cups are sure to keep your drink the perfect temperature. After reviewing my poll and asking the students of SHS which coffee place is their favorite, I’ve come to find out that it depends on your personal preferences. There are certain drinks at Caribou Coffee that are better than Starbucks and vice versa. You just have to find a drink you like, a coffee place close to home, and some friends to enjoy your drinks with. If you are interested in visiting the Caribou Coffee website click here. If you are interested in visiting the Starbucks website click here.